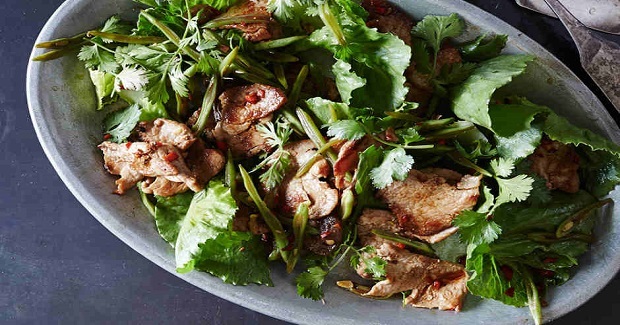 Stir-Fried Pork With Eggplant, Chile, And String Beans Recipe - Gutom Na! Posted on Thursday, June 2nd, 2016 at 3:59 pm. Place pork, garlic, fish sauce, soy sauce, and brown sugar in a medium bowl. Let sit at least 5 minutes. Heat 1 Tbsp. oil in a large skillet over medium-high heat. Transfer to a plate. Repeat with 1 Tbsp. oil and remaining pork. Add 1 Tbsp. oil, eggplant, beans, and 1 Tbsp. water to same skillet, scraping up any browned bits. Cook, tossing often, until beans and eggplants are tender, 8–10 minutes. Add chile and reserved pork to skillet and cook, tossing often, until flavors meld, about 2 minutes. Toss romaine lettuce and cilantro on a large platter with remaining 1 Tbsp. oil; season with salt and pepper. Spoon pork and vegetables over, tossing gently. Squeeze lime over.